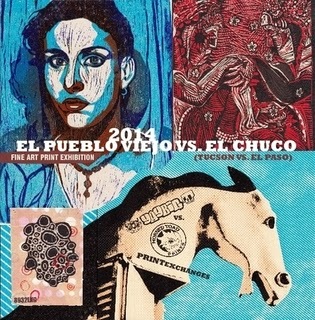 We modeled this exchange after the Horned Toad Print Exchange, and exhibited together in El Paso and Tucson -- calling the exhibition "El Pueblo Viejo vs El Chuco." Prior to that we bought and showed prints as YayBig Southwest Print Collection. YayBig Southwest started as an extension of the former YayBig Gallery in downtown Tucson, which was run by Joe Marshall, a significant woodblock printmaker. 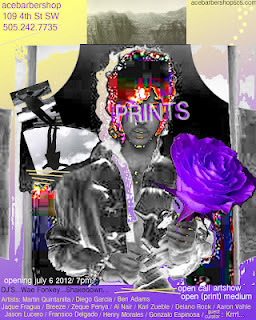 We wanted to show art in El Paso, and thought it would be appropriate to start with printmakers in Joe's circle. Ultimately we showed the collection in pop-up galleries throughout the desert, buying new prints everywhere we went, and snowballed throughout the Southwest. In July 2102, we brought prints from Tucson to show with printmakers in New Mexico, at the Ace Barbershop, in downtown Albuquerque.